The new funding of non-governmental social services is, according to Simon Collins, society's acceptance of a further need to socialise what were once family responsibilities. He refers to this move as the "logical end point." What will happen is their demand for public money will continue to increase irrespective of performance and the taxpayer, who could previously choose whether or not to support these 'charities', no longer has any say in the matter. Some agencies now plan to take on new social workers or increase remuneration to paid staff. What we will see is a further expansion of the welfare industry. What we won't see is any let-up in demand for what are mostly bottom-of-the-cliff services. That is because the benefit system - which once primarily responded to need but now creates it - remains unchanged. It will continue to provide incentives and backstops for people to behave in ways that are damaging to themselves and their children. Collins presents the reasons why the welfare state grew as inevitable. Extended and nuclear families broke down as a result of urbanisation, the loss of full employment, the pill and women's liberation. The state had to replace the support no longer available from parents, grandparents, siblings etc. But he makes no mention of how people's attitudes and values changed in response to the increasing ideology and level of collective responsibility. Taking personal responsibility for one's actions became less expected, admired or necessary as the state promised to pick up the pieces. Having children alone became socially acceptable. Self-destructive habits became illnesses and afflictions rather than self-indulgent shortcomings. As more and more people resorted to welfare benefits any stigma diminished. The culture of rights replaced the culture of morals. Crime worsened from the 50s - not the 70s - as those changing values crept in. Increased crime was not primarily a result of sky-rocketing unemployment or the economic reforms. It was a result of a loss of those values that prevail when people rely on themselves and each other; when they need to live co-operatively and constructively together. Benefits which accrue to people no matter why they find themselves unable to work, damage society. Alcohol and drug abuse, casual child bearing, idleness, violence and dysfunction are possible and perpetuated through income from benefits. The agencies the taxpayer is now going to fund, to the tune of nearly half a billion dollars, typically work with the families who exhibit all these types of behaviour. Simon Collins writes that this new funding is a "historic change". Indeed. It is another win for state collectivism and another nail in the coffin of personal responsibility. Things just took a turn for the worse. That will lower the collective IQ of the National Party a few points. All the best Katherine. I am sure you have made the right decision. Isn't that exactly the message our government needs to hear about New Zealand society. Which reminds me of something else I was chewing over. The business of Working For Families and taxing those without children to support those with. The major justification given for this is those parents are raising the next generation of taxpayers. But at the rate this country is going there is no guarantee of that. Many young people leave and don't come back. Part of the reason they flee is they do not relish the prospect of being highly taxed to pay for other people's children. Here's a question. Have welfare states anywhere produced an increase in the average family size? 'Supporting' families is code for vainly attempting to centrally plan society. It treats people as state lackeys, units for wealth extraction. Interfering in the structure of society has similar results to interfering in the market. Ultimately less is produced. A few inefficient industries are retained through subsidy but at a cost to those who might otherwise thrive or create new enterprises or innovations. Intervention in families has the same stifling effect as intervention in the marketplace. They can call WFF 'tax relief' but it is just another facet of socialism. The headline reads "Govt to give $446m to help troubled families"
The government is going to add close to another half billion to the welfare bill that creates these troubled families in the first place. Troubled families receiving NGO services are almost always beneficiary families. Many families typically have three or four service providers working with them. Many will have children who were born onto a benefit. They will have debt problems, sometimes gambling, drug and alcohol abuse problems. They may be methadone patients raising children. They use foodbanks habitually. They are at risk of losing their children if they do not comply with plans devised by CYFS. Depression is common. As much as I support volunteers working with these families more government funding will probably just be good money after bad. Volunteering (apart from transport costs) has no financial cost. Costs come with paid staff, offices, administration and bureaucracy. As I have said before - at that stage NGOs become almost interchangeable with government departments. John Howard introduced 'welfare quarantines' in the Northern Territory. That means that beneficiaries have half of their welfare income quarantined to a local shop to pay for food, electricity and clothing. Reportedly the scheme has been well-received, by aboriginal mothers especially. Now only half of the previous amount of cash is available to thieves and there is a "guarantee of food on the table". Now Hone Harawira has just announced he is off to Australia to persuade Kevin Rudd to scrap them. The Salvation Army Report asks, who is caring for the children of those single parents moving off welfare and returning to work? Because the early childcare and after school care is least available in the poorest neighbourhoods where those parents generally live. But single parents only have to work 20 hours a week (or 4 hours a day) to receive the In Work payment, which is what the Salvation Army claims is enticing single mothers back to work. So combining caring for children and part-time work doesn't necessarily require any other provider. And according to the latest Household Labour Force Survey the big increase is in part-time employment which rose by 6 percent in the year to December 2007. Full-time employment only rose by 1.5 percent. In absolute terms there were more part-time jobs created than full-time. In the Sallies ideal world all single parents would be at home to care for the kids, supported by the state if need be. They prefer the view that neglected children and troublesome teenagers come out of home where parents work. Not homes where parents rely on welfare. Unfortunately for the Sallies, the evidence doesn't support this. So again I say they are deceiving themselves. It is now February 2008. In 6-9 months I'll have to step into a polling booth and put a tick by a party. And right now there isn't a tick I can make that gives me any hope that New Zealand will be a better place for my kids. Do you think I am alone? I don't. The message I am getting repeatedly is no party is putting an alternative view. The one party that believes in choice isn't offering it. When pushed they might express a viewpoint at variance with Labour or National but they aren't shouting it from the rooftops. It was once about the media ignoring releases but now the releases aren't even generated. Let's cut to the chase. ACT's leader needs to hold Epsom. If ACT expresses 'unpopular' views which appeal to 10 or 20 percent of voters, that's great across New Zealand - but it's not enough in Epsom. So ACT are in a bind. But if they carry on being irrelevant to most of New Zealand but acceptable to Epsom, and return with 1 or 2 MPs again, they will face the same problem all over again. Rodney said attacking never got ACT anywhere. Their vote collapsed in 2005. I believe the vote collapsed because Don Brash led National. Now people are sticking with National because there isn't any other party offering them a convincing alternative. ACT needs to attack. God knows there is no shortage of targets. Not attacking for the sake of it. Attacking because something is wrong, or inefficient, unfair or a waste of space. Attack Working For Families, the student loan fiasco, the Buy NZ Made campaign, the Maori seats, Paid Parental Leave, lifestyle welfare, the school 'donation' scheme, the Families Commission, the Children's Commissioner, Women's Affairs. Stick fast to your founding principles and start doing some rabble rousing. Start fighting to get back the support that went to National. Because a Taxpayer's Bill of Rights isn't going to do it. And the Regulatory Responsibility Bill isn't going to do it. As laudable and valuable as they are, these policy bottom-lines are too complex for sound bites and one-line reporting. If you haven't got the interest in a few seconds that's it. I understand the bottom-line policy strategy. That's important too but those bottom-lines need to be very simple. Less is more. ACT has always appealed to the intellect but it needs to appeal to emotions too. I want ACT to survive, passionately. I voted for Rodney Hide to lead the party and have never regretted it. But I don't want to see another three years like the last. I have a shirt somewhere that says, "ACT - The Real Opposition". I paid some ridiculous amount of money for it at a fund-raising auction because I believed the message. That is what ACT now needs to show the public again. Consistent, loud, reasoned and civil opposition. That is ACT's job. To restrain government. The Salvation Army has just released its first ever "State of the Nation" report. "As a country we have invested hugely in core social spending, from $23b 10 years ago to $39b this year, but with very little increase in social progress. In fact, the gap between rich and poor appears to be widening.While this social spending is essential it seems to have contributed very little to our social progress. Why should be this be the case?" Could it be that welfare long since stopped majoring in meeting need? It now predominantly creates need. It draws in very young families who get stuck. It offers incentives and subsidies for all the wrong behaviours. Yet, make no mistake, this outfit wants a bigger welfare state. In 2004 Campbell Roberts, its author, was at a Green Party conference calling for them to eradicate systemic poverty. And we know what the Greens solution to poverty is. More wealth redistribution by the state. If you do nothing else take a look at the cover of this publication. It features a two-parent, two-child family who couldn't be more different from the people this report is actually about. More self-deception. That's what this paper should be called, "The State of Self-deception in New Zealand Report." "....under this Government we have more Maori in prison than we've ever had before...."
So says Dennis O'Reilly responding to Shane Jones who is having another "crack" at Maori gangs. What Mr O'Reilly says is true. But it would have been true if it was claimed about any government since Maori started to move to the towns and cities. The prison population, since the second world war, has steadily risen as has the proportion that is Maori. According to the Howard League in the 1920s 4% of the prison population were Maori, rising to 6% in the 1930s and 15% by 1940. By 1989 they formed 49% of the prison population. The earlier low prison rates were not because Maori were more peaceful and law-abiding, a view some politicians proffer. The evidence points to them resulting from Maori and Pakeha forming quite separate societies. Moana Jackson says that today's offending by Maori cannot be divorced from the spiritual and material poverty created by the ongoing consequences of colonisation. Yet the victims of Maori crime tend to be Maori and if they want the protection provided by a system of law and order, which includes prisons, then colonisation has afforded them this. Material poverty? Hundreds of thousands of low income Maori have had jobs, raised balanced kids and stayed out of serious trouble so that doesn't cut it either. Spiritual poverty? What exactly is that? Alan Duff might describe it as self-loathing which prevents the individual from caring about anyone else. That I can accept but who causes it? Who crushes the spirit in people? Those closest to them I'm afraid. Dennis O'Reilly clearly believes the high Maori imprisonment rate is a problem for government to solve. It isn't. It is a problem for individuals to solve. I know a young man who's father is in and out of prison, who has attempted to get his son into a gang. So far, apart from a minor misdemeanour, the youth is OK, holding down a job and involved in sport. I would say his mother has made the difference, countering the father's input. I have helped him put together a CV and we've sent off job applications in the area he is interested in. I helped him with a passport application form. Little things. But his mother cares about him and I care about them both. It is individuals and their relationships that make a difference. Not faceless intangible social systems overseen by governments. All they are good for is blaming and buck-passing. WFF - tax relief or welfare? Has anyone done a study about working people receiving working for families such that the amount they pay in tax is lower than what they receive under WFF plus other benefits? These people are by definition beneficiaries as well. Is Working for Families “tax relief” or “welfare”? United Future MP Gordon Copeland, the party’s spokesperson on Revenue, recently asked Finance Minister Dr Michael Cullen for a break down of the types of families who will receive financial assistance through the Working for Families package. “I asked the question of Dr. Cullen because, whilst Labour refer to Working for Families as “tax relief”, National habitually characterise it as “welfare”,” said Mr Copeland. Yesterday a significant experiment was conducted in the Mitchell household. It was conclusively proved that a potato-top pie, in particular, a large family-sized potato-top pie purchased from the local butcher, when dropped from a height of 1 metre, does land potato-side down. No repeat or variation of this experiment is planned. Although it has been suggested that if the pie was tied to the cat's back during it's progress from oven to dinner table, and the cat was to fall from a height of 1 metre, a different outcome may be achieved. Bacon and tomato sandwiches are very wholesome and satisfying. Violent Crime: How does provincial NZ compare to New York? Stephen Franks has a post about violent crime in New Zealand and compares Central Districts to New York. This is a comment I have just made. In the 2000/01 year it rose to almost 3 per 100,000. However, if you look at violence overall, at its peak New York experienced 1180 violent crimes per 100,000. By 2006 this had dropped to 435. 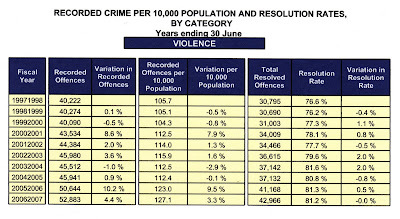 In Central Districts in the year to June 2007 there were 1265 violent crimes per 100,000 population. So the likelihood of being murdered in the Manawatu, Taranaki or King Country is still less but the likelihood of being a victim of violent crime is considerably greater. Update; The New York rates refer to state rates. Murder in NYC peaked at 30.8 per 100,000 in 1990 and has fallen to around 6 today. According to the US Dept of Justice in 2002 the overall violent crime rate in NYC had dropped to 790 per 100,000. If I use the latest NYPD stats and 2005 Census population count (not entirely satisfactory) that has now dropped to around 663 - still much lower than Central Districts. 1/ Tino rangatira tanga - the Greens support the idea of self-determination for Maori. Their MP Metiria Turei is very active in this area and the Greens have a Maori campaign to effect this. 2/ I know Maori who voted Green purely on the decriminalisation of cannabis policy. If Hone's tobacco prohibition puts off potential voters then the Greens decriminalisation of cannabis might attract them. 3/ The Green attracts a young vote. Maori are a young population. 4/ Both parties are supporting the Child Poverty Action Group's court action to have the In Work payment paid to parents on benefits. The Greens and Maori are strongly pro-DPB. 5/ Both have collectivist philosophies. 6/ The Maori Party supported Bradford's anti-smacking legislation despite many Maori being against it. Titiwhi Harawira in particular. 7/ The Greens will support repeal of the Seabed and Foreshore legislation. 8/ Both parties (think Hone and Keith) are very vocal in the area of ethic minority rights, here and outside of New Zealand. 9/ They are both on the left of the political spectrum. Sorry, the last was flippant. But far from being an impossible scenario I can see how these two parties can scratch each others backs politically and together decide which main party forms the next government. "It's not over till the fat lady sings..." could literally have us looking to Tariana Turia to fill her lungs and let rip.